Joint with LiVelY sCaNs, you can read through their online manga reader! So I lied, 3 Level Combination ch 8 is not today. 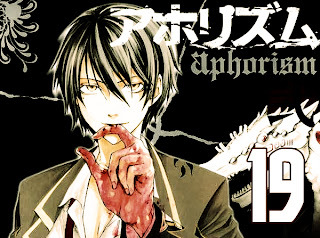 Aphorism ch 19 was released ahead of schedule, since we already had it ready for release and we figured we might as well. NEXT will be 3LC ch 8 I promise. Our scans are not the greatest quality, since we found them online (jcafe) but hopefully these releases are readable. Anyways, enjoy. Chapter 20 will take a while since I haven't even started work on that yet. Thanks alot for the chapter!! Haha, I hope so too. Thanks for commenting. Yay, another releases. Thank you so much for the great release!! ..but it won't be at this "crazy" speed LOL. However I have acquired a typesetter for this series, so it won't be me translating + typesetting everything (hopefully meaning faster releases). Haha, I'm sorry they scare you...does 3 level combination also scare you? Thanks for commenting - did you get a blog now (I don't think your name was clickable before)? with forthcoming post. Thank you 1,000,000 and please keep up the gratifying work. of occasions previous to I may get it to load properly.